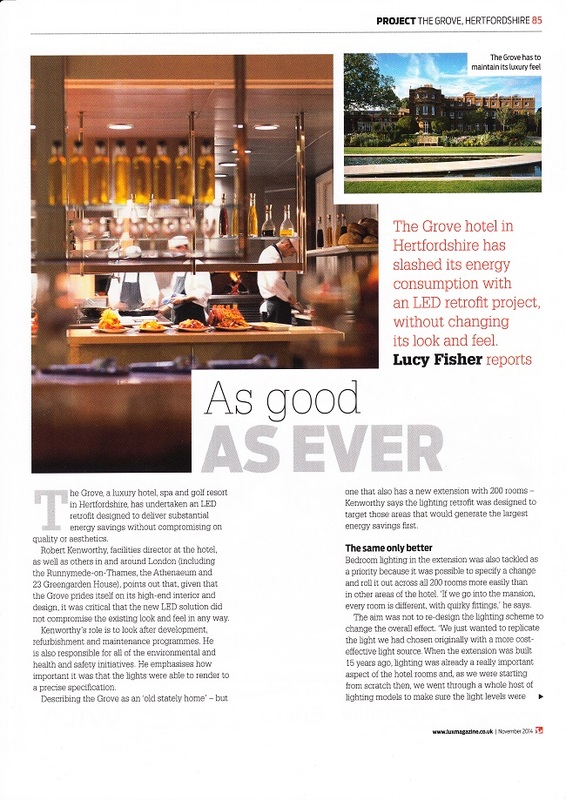 The Grove luxury hotel LED lighting retrofit by SaveMoneyCutCarbon.com is featured in the November edition of Lux magazine. The Grove in Hertfordshire has slashed its energy consumption with the LED retrofit without changing its look and feel. Robert Kenworthy, facilities director at the hotel and other luxury properties owned by the Ralph Trustees group emphasises in the article the crucial importance of ensuring that the lighting render matched a precise specification. Robert was keen to find a lighting supplier that could also install the new lighting scheme. For that reason he chose to work with SaveMoneyCutCarbon, noting that we also provide advice on reducing costs across other major areas of energy consumption – water, heating, ventilation and boilers.